Because you're never too old! At Starchild you will find a fantastic choice of baby shoes, which will help cushion your baby's small feet, whether crawling, bouncing or walking. Our leather baby shoes are fully breathable, which help to keep your little one's feet healthy. 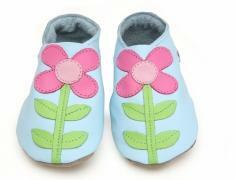 The soft leather upper is not restrictive and will allow the baby's feet to keep developing naturally. The non skid, suede sole gives the shoe extra grip when used on wooden or tiled flooring. The ankle strap is elasticated to help keep their socks on and ensures that the shoes don't fall off too easily. All our shoes are made in Britain, from soft leather making them both comfortable and lightweight and are ideal for both baby and toddler. 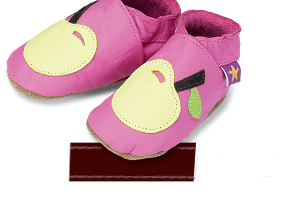 We have a great selection to choose from, with a range of shoes for newborn babies including the Twinkle White, which features a leather star and Fairy Baby Pink, which is embroidered with flying fairies. Our range of luxury gift sets make fantastic presents for friends or family, including the Little Britain Gift Set, which has a Union Jack design and matching T shirt. The cheeky monkey gift set has a monkey face design and also includes a cotton T shirt. We have footwear for both boys and girls, with shoes that include Lacey Rose Red summer sandals featuring red satin roses and Guitar Navy Rock Star shoes, which proudly display a red Fender Stratocaster style design. We have a fantastic range of baby and newborn baby shoes for your little angels.